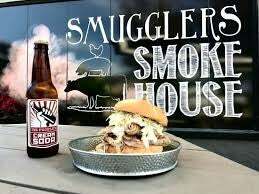 Smugglers Smokehouse is located in the heart of downtown Penticton and offers classic, traditional southern style BBQ meats and accompaniments as well as delicious floats, milkshakes, coffee, beer and simple cocktails. Creating an exceptional and laid back eating experience for guests by using only the best ingredients and by producing menu items from scratch is the foundation for our success. Of course, all the meat is seasoned and smoked in house.